The idea behind the Mac Mini is a small low-power-consumption computer that can easily be snugged into a corner and reuses an existing keyboard, mouse and display. It&apos;s a low-cost route to owning a Mac, that is useful in a wide variety of settings. Apple initially positioned it as a Switcher machine, meaning an existing Windows user could buy a Mini and reuse other equipment they already had. But the Mini has seen use in home theater systems, as a rack-mountable server solution for e.g. rendering farms, and for software developers. Where the Intel NUC is hugely better than the Mac Mini is that the NUC is easily and completely upgradeable. Where Apple changed the Mini to be a closed box that&apos;s hugely difficult to perform simple upgrades like replacing the memory or disk drive. These items are normal upgrades or replacements that are easily performed by end-users or service technicians, but Apple&apos;s policy seems to be to gouge customers by preventing us from servicing or upgrading our computers. The Intel NUC fits the same niche as the Mac Mini, but as I said is completely customizable. You can completely disassemble a NUC, upgrading or replacing any part. It&apos;s yours and you can do whatever you like with it. With the 2018 Mac Mini, Apple has kindly returned to us the ability to upgrade the memory. But the SSD is hard-wired to the logic board, as is everything else. Therefore as powerful as the 2018 Mac Mini is, it&apos;s still a largely closed box. More importantly is that the Intel NUC can be configured similarly to the 2018 Mac Mini at less than half the cost. All the details are below. The 2018 Mac Mini returns us to the days of twisting off the bottom to replace the memory sticks. Nothing else is replaceable. 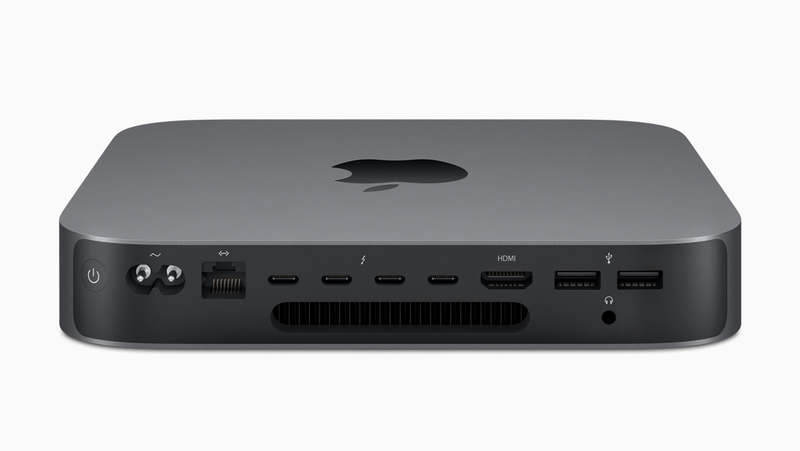 The 2018 Mac Mini has a similar set of ports on the back as previous models. A welcome upgrade is using USB-C ports, and making Thunderbolt 3 available over USB-C.
Memory is 2666MHz DDR4 SO-DIMM memory, as we&apos;ll see it accepts two memory chips, they can be easily swapped out, and can handle up to 64 GB of memory. Hence, Apple appreciably is allowing one easy upgrade, the memory. The storage is a different story. They used a hard-wired PCI-e SSD making it impossible to replace the SSD but giving optimal performance by not using a SATA interface. The SSD is available in sizes from 128GB to 2TB. For video it can support either 2 or 3 displays using a combination of Thunderbolt 3 and HDMI. The Thunderbolt 3 ports are dual-purpose with USB-C, and there are two traditional USB-3 ports using the USB-A connector. Ethernet supports up to 10Gbps. As Mr. Schiller said, they used the same box as before -- but all-importantly it is now available in space gray. Ooooohhh... space gray. That&apos;s a lot of computing power in such a small box, as Mr. Schiller said. Apparently benchmarks are starting to show up that the 2018 Mac Mini packs a lot of punch. That base price is a bump up from the previous Mac Mini base price. Sigh. Memory upgrades are at gouging prices, 16GB for $200, 32GB for $600, and 64GB for $1400. Fortunately we can buy 3rd party memory ourselves and save a bunch. SSD upgrades are another story since this item is not user serviceable, 256GB is $200, 512GB is $400, 1TB is $800, and 2TB is $1600. Another upgrade is the 10GB ethernet, which is a $100 upgrade over the 1GB ethernet. This is what I see as the most likely upgrade, with the 512GB SSD as a close second. It&apos;s easy enough to get external USB-C storage at a cheaper price than Apple&apos;s pricing. Of the latest Intel NUC&apos;s the 8th generation BEH models are the closest to the Mac Mini, however the specs don&apos;t quite match up right. As I said these don&apos;t quite match up. For example maximum memory configuration is 32GB, and it uses DDR4-2400 memory rather than the max 64GB DDR4-2666 memory on the 2018 Mac Mini. The USB and display configuration is also a little different. That the memory maxes at 32GB means the NUC can&apos;t handle as large a workload as the fully maxed out Mac Mini, but it will come close. As for the disk interface, the Intel NUC BEH model supports dual disks, a PCI-e M.2 slot with four PCI lanes, and a SATA interface to a 2.5" laptop drive. I don&apos;t know how to compare performance between the two. A 64GB kit is not available, but you can see the prices are a fair bit cheaper than Apple&apos;s memory prices. The specs on this versus what Apple is providing may not be the same, but heck this is a ton cheaper than Apple&apos;s pricing. In addition this NUC model has the option of using a 2.5" laptop drive, and even using a RAID configuration between the two. Since the specs don&apos;t quite match up we have to go with these configurations for comparision. For less than half the price we can buy a comparable Intel NUC. Most of the premium price is the 2 TB SSD for which Apple charges $1600.